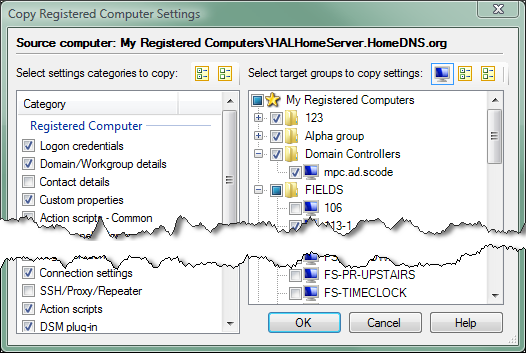 The VNC Manager allows to copy registered computer settings to other registered computers. To copy the settings open the context menu on a registered computer you want to copy the settings from and select "Copy Registered Computer Settings…" command. You will be presented with a window allowing to select the settings categories to copy and the registered computers tree allowing to select target groups or individual computers. You will be presented with a window allowing to select the settings categories to copy and the registered computers tree allowing to select target groups or individual computers. By default the right tree shows registered computers groups only. Click on the "Show Registered Computers" toolbar button if you want to select individual registered computers.